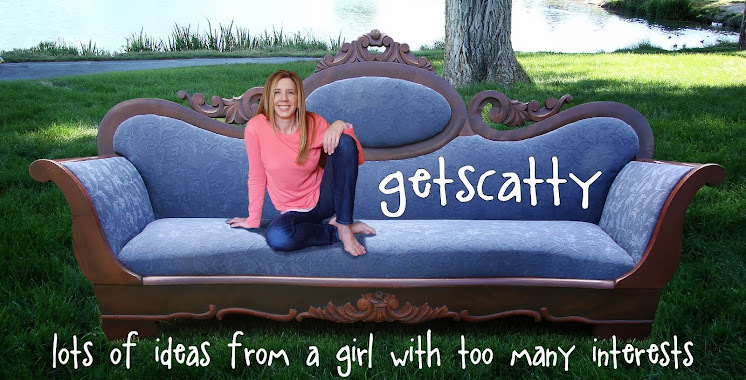 Get Scatty: Nice & Easy Shelves! I had a wall that was in desperate need of some happiness. I spent quite a few weeks thinking about what I would do, and when I came up with the idea of a couple off-set shelves, I knew I had the answer. This is a room I spent quite a few weeks on removing the orange-peel texture by plastering over it and painting it "Dune". With this new blank canvas... I measured and decided on the length of shelves. I went to Home Depot and got myself some straight pine boards. Most boards are warped a bit, so I had a real good look for ones that were as straight as I could find. The narrow board was first screwed into the edge of the wide board. I pre-drilled all my holes, but connected the ends first, drilling and screwing everything in between afterward. Then I painted them black. I used a stud finder to screw them into the wall with long screws. Shelves like this wouldn't be too good for a row of books, but since they were for decoration, their construction is strong enough for these small things. 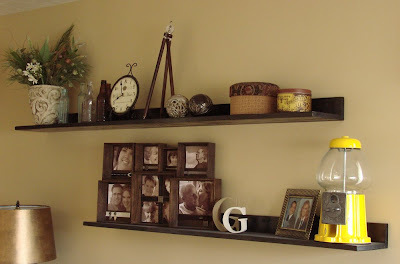 Check out HERE if you want to read more about the stacked photo boxes on the shelf. Short post, but an easy project! Those shelves are wonderful! I love to see some much different stuff on a shelf! The picture frames are awesome btw.